Click here for our line of popular Hollywood-inspired cards! We have a large selection of standard paper from which to choose. So let me know what you are looking for (email or call me) and I'll make some suggestions based on budget, card weight, card texture, card color, print process. We'll find the perfect stock for you! Almost all of our stocks contain recycled materials. - Our standard colors are included in our business card pricing. If you want to use non-standard PMS ink colors add $50-87 per color (will depend upon the cardstock). Allow 5-8 working days for most PMS orders. These colors are only a close approximation. All are Pantone colors except for the Burgundy which is Van Son Bordeaux. Thermography (raised lettering) is standard unless you request flat ink or a stock that can only use flat ink. 2nd-side printing can sometimes only be in flat ink. - Nonstandard color combinations may take longer and cost more. I will let you know when you start your order. - Screens of less than 50% are not recommended for raised printing. Foil colors are available at special pricing. Please inquire. Our standard foils are: Matte Silver, Silver, Spectrum Silver, Copper, Matte Gold, Gold, Teal, Matte White, Black, Steel Blue, Cyan, Blue, Lavender, Orchid, Purple, Rhubarb, Burgundy, Red, Apple Green, Emerald Green, Moss Green. Full color (digitally printed) is also available. If you're not sure what works best for your design, then just email me your ideas and I'll help you decide! Blind Embossing and Foil Embossing are available at special pricing. Please inquire. See this page for an illustration of some of the different printing types. Most of our cards are sold in quantities of 500, 1000 and multiples of 1000 after that, per name. 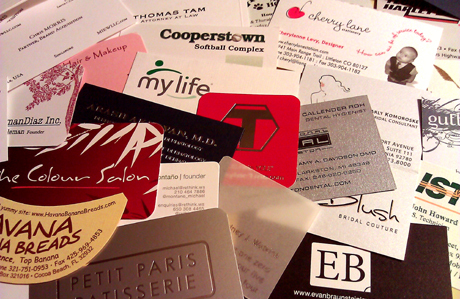 In some cases there are multi-name discounts, but that only applies to orders of four or more. Remember to send me your name, address, quantities you're interested in... use the above steps as a checklist. If you have your art on file, email it to us. We work in Illustrator/Freehand/Photoshop and can open most electronic files. Please do not send us Word files without also sending all fonts and graphics that you used separately. If you need a new look, please check out our Logo Design page. If you need us to set up the business cards for you, setup charges may apply — I will let you know right away. Once we finalize your order I will send you proofs and an invoice with payment instructions. Don't forget to let us know your name, the paper, colors, quantity and your shipping/billing addresses.